Well it is true! It’s December already and right on queue we are starting to hear about the first winter chinook, or feeders as they are sometimes called. These are chinook that hangout in our local waters in the winter and are aggressively feeding on herring. They are some of the scrappiest and tastiest chinook you will ever catch and are a favourite of our local clients and the guides. Locally there have been a few fish caught in Vancouver Harbour as well as Howe Sound. There is also a large derby in Washington this weekend that some customers and fellow guides are in. The results from this derby will be a good indicator as to the strength of the winter chinook fishery just south of us. A lot of the winter chinook we catch up here are US fish, so I am looking forward to seeing how the fishing is during this derby on the weekend. There are 100 boats entered and they have catch stats from all previous years so it is a decent indicator. A quick primer on these feisty winter chinook. The main key to catching these fish is getting your gear down to the bottom and keeping it in that zone. These fish are cruising the bottom looking for herring. That might mean 100 feet or it might mean 250 feet, it depends on the spot you are fishing. During this fishery we usually fish 2 rods, just one on each downrigger, and we fish 18 LB cannonballs. This allows us to troll fast, cover water, and keep our gear close to the bottom while doing so. I already alluded to the second important factor for this fishery, and that is covering water. These are actively feeding, aggressive fish. That means they aren’t necessarily hard to catch, but they can be hard to find. Here one day gone the next is a common scenario when fishing for winter chinook. One of the best choices when trolling fast and also deep are artificial presentations like spoons and hootchies. They are more durable than bait and you can use finishes that glow. This is key as it is pretty dark down there at 200 feet. You can and will catch fish on bait in a glow teaser head, but a glow spoon or glow hootchy seems to work as good if not better. The same goes for your flasher, the water is clear in the winter, but if you are fishing deep, a flasher with some glow on it is critical. 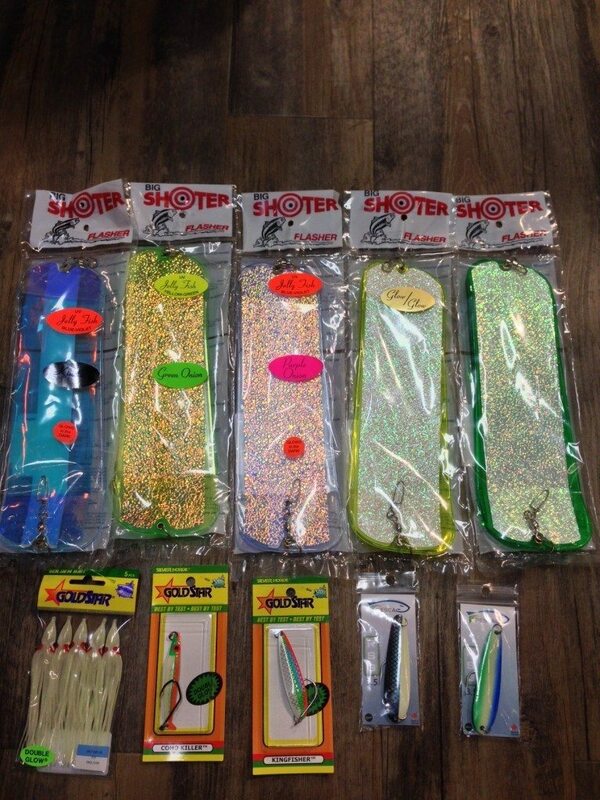 Green Onion Glow, Purple Onion Glow, and Kinetic Glow are all excellent choices when fishing the 100-150 zone and when you are really deep, say 200 or more, a Chartreuse Glow, Green Glow or Double Glow flasher is the way to go. An added bonus is that crabbing and prawning is usually quite productive throughout the winter months as well. Although you wouldn’t think it from the winds this week, often the winter sees the calmest seas of the entire season. So while the rivers are out and the steelhead have yet to come, think about winter chinook fishing and give us a call to book a trip for Dec, Jan, or Feb as it is some of the funnest chinook fishing of the year.